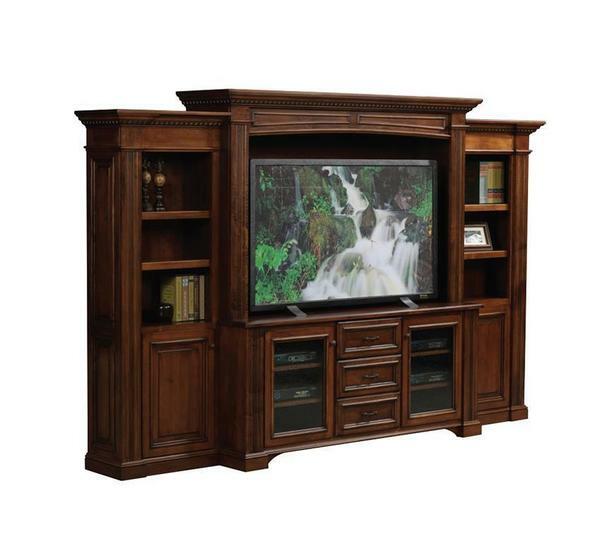 The Amish Lincoln Entertainment Center with Side Bookcases would make a president proud! No detail was spared in the exceptional design of this carefully crafted unit. If you are looking for the perfect way to take your living space to new heights, the Lincoln is just right for you. Enjoy superior quality in every inch of this superb center that will soon become the hub of your home. Handmade in America by expert Amish woodworkers, you will be delighted again and again by the unmatched attention to detail that is apparent in every aspect of the Lincoln. From its dovetailed drawers to its 1" solid hardwood tops, you'll be able to experience family time on a whole new level. Made for much more than just a television, you will find ample space to house all of your media needs. Its side bookcases provide an excellent way to display your favorite reads and decor with pride. Featuring 4 large cabinets, including 2 in the center unit complete with electronic-friendly glass doors. 3 beautiful drawers sit between these cabinets and make for a great way to keep clutter at bay. You can also choose to do away with these drawers in order to make room for a fireplace, adding even more warmth to this luxurious piece. Customize the design of the Lincoln to suit your family's every need. Bring the beauty of Colonial inspiration into all of your occasions. We love the idea of casual family time accented by such a luxurious entertainment center. Few things are more important than the time we share with our loved ones, so why not invest in a piece of solid wood furniture as unique as your home? Our Amish craftsmen share in the sentiment of family above all, allowing them to create pieces that match the specialness of time shared together. Please do not hesitate to get in touch with a friendly Amish furniture specialist by calling 866-272-6773. Happy to guide you through the process of creating the entertainment center of your dreams, they'd love to answer any and all questions that you may have about our American made furniture. Take a look at the Lincoln available without the center drawers shown here. Also, be sure to check out this fabulous design in the TV Stand version with optional hutch top. Note: Because of the nature of Brown Maple, expect color variations in the stain. We have received our Amish Lincoln Entertainment Center with Side Bookcases and couldn't be more thrilled! Our order included a long list of special modifications, ending up with a center measuring 150" wide by 94" tall out of solid Walnut. It completely lived up to the website pictures of lovely trim and detailing. Lauren was a joy to work with, even though it took me months to decide what we wanted. I had never before ordered such a piece, sight-unseen, online. I am extremely picky, and was very nervous about how it would turn out. It was shipped cross-country to Oregon, and arrived in perfect condition. Even the movers were terrific! They stayed with us, setting it up until we were completely satisfied. It took an extra month to construct their masterpiece, but it was certainly worth it. Thank you so much, DutchCrafters! I mean every word of it!